The Olympic Torch passed through our city today and though I'm not usually one for hanging around on street corners cheering a bloke running around with a fire on a stick, I took The Boy. The Boy was off school ill having woken up with nothing but a croak for a voice, and The Torch was setting off on it's Wakefield leg from the very end of our street so I thought we might as well have a casual wander down there, a bit of a wave and a wander home. His school class was intending to do the same further down the route and he was appalled he would miss it. Won't be many people to cheer it on round here, I thought. At 9.15am, with the Torch's arrival still a couple of hours away, I noticed small groups of people forming at the end of the road. At 10am, you couldn't see the end of the road for people. Mmm, I further thought, grabbed The Boy and set out to find a decent vantage point among a suddenly swollen river of people. The crowd now had a definite throng about it. There were people dressed in red, white and blue. Other people waving flags. There were hats, and flags, and badges, and more flags. I felt woefully under-prepared, the only thing we had to wave was a crumpled five pound note. Though as we waited it soon became clear that my crumpled fiver would have been the most appropriate thing to wave after all as the Olympic Games sponsors' vehicles drove past handing out balloons, free carbonated drinks and things to wave, Lloyds green be-ribboned sticks replete with advertising no less. The crowd tutted a bit, grumbled a bit and went back to waiting for The Torch. We waved at people. We waved at the TeenTwins who were in a gaggle of their friends across the road and were busy ooh-ing, aaah-ing and clapping anything and everything that passed in that hugely amusing *cough* way that people do. The crowd, clearly inspired by their example, decided to do the same and it would have been nothing short of churlish not to join in. So we waved at the police motorbike riders who veered about slapping out the low-fives. 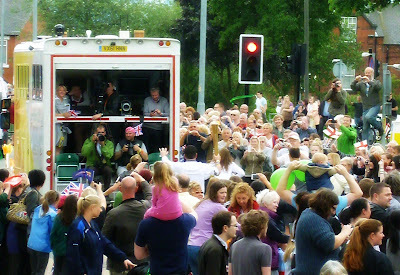 We waved at the bus and the people on it (or those of them not entirely terrified by the impromptu reception) waved back. We even waved at the dustbin truck and the dustbinmen also, very graciously, waved back. But then there was a mumble, a low rumble in the crowd. People were shuffling forward, pushing pushchairs into the middle of a dual carriageway with a determined look on their face as they searched for an even better view. Policemen suddenly looked purposeful and upright. 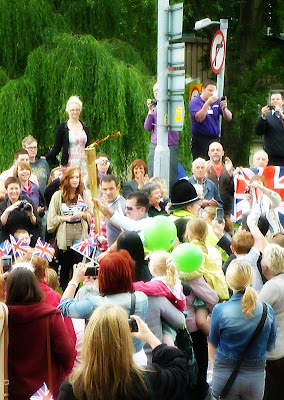 Someone said The Torch was just minutes away. It was half an hour late but no-one said: "About flaming time." Then there it was. Everybody cheered and everybody clapped and everybody roared hurrah. Everybody looked around at each other sheepishly, shuffled a bit and started heading home. Within three minutes the road was empty of anything other than a few deflated balloons and a couple of trodden on flags. 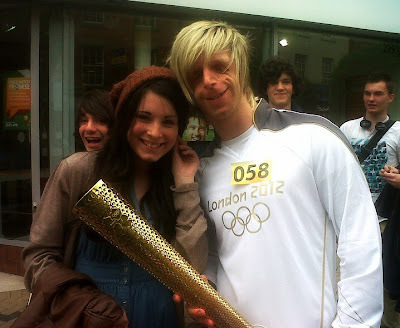 The TeenTwins and friends ran on after The Torch to follow it on it's journey through the city and a very VERY small part of me wished I could do the same because, just for one brief flicker of a moment, having some bloke running down the road with a fire on a stick was, well, exciting. But I didn't. And because the TeenTwins and friends were suddenly gripped by the whole Torch experience, TeenTwin 2 got to meet one of the Torch Bearers, who also happens to be one of her heroes. He is Jono Lancaster and he really IS inspiring. So hurrah for The Torch and hurrah for it's relay runners and a tut and a sigh at the attendant promotional packaging.